You are looking for a presenter? You have found a passionate professionell host. Maxi Sarwas is hosting events and exhibitions, she works for TV- and radio stations. As a professionell presenter, beside of her On-Air work, she also hosts and designs many international Off-Air events and trade fairs. 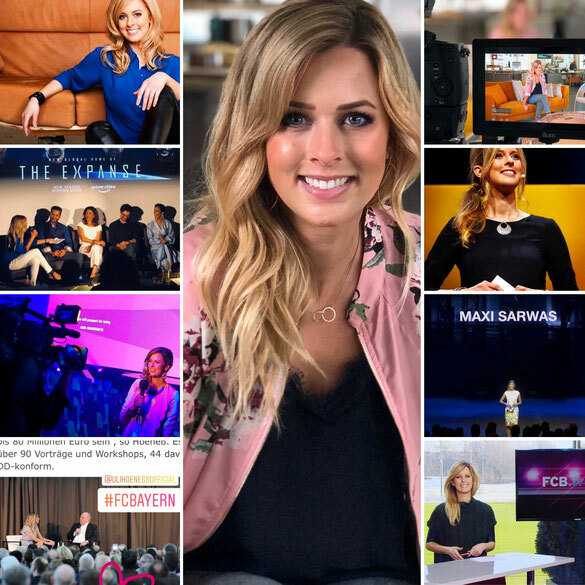 Maxi Sarwas is presenting premium events for premium brands such as Deutsche Telekom AG, Lufthansa, BMW, Audi, Porsche, Casio, Panasonic, Siemens, Sky, RTL interactive, ProSieben and the famous FC Bayern München. Her always charming, competent and confident way of imparting information makes her the perfect presenter even for your complex line of business. Evening events, exhibitions and charity as well as open forums. Let your event become a special day - you have already found the perfect presenter! Maxi Sarwas is one of the best professionell presenters in Germany. She is hosting national and international premium events. Visit Maxi Sarwas at Facebook and Google+ or at Instagram.